The Tri-Service Safety Officer (TSSO) is an innovative, ever changing, adaptable and flexible role which integrates within the emergency services family. The role has been piloting for over 3 years (originally a 2 year pilot) in 2016 the project was extended for a further 18 months in order for independent evaluator Munro Research and Evaluation to gather further data in relation to the role’s activities, complexities, advantages and disadvantages. The Tri-Service Safety Officers (TSSO) purpose is to provide a ‘supportive link’ between Devon and Cornwall Police (DCP), Cornwall Fire, Rescue and Community Safety Service (CFRCS) Service, South Western Ambulance Service NHS Foundation Trust (SWASFT) and Cornwall Council’s Anti-Social Behaviour Team. The role has a number of additional responsibilities such as; Safeguarding Advocate, Youth Intervention/ mentorship. 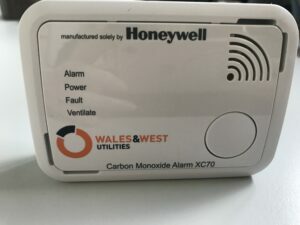 The role is not a single element of the areas described above, it provides a unique and innovative approach to resolving community safety matters. The role targets and aligns with all of the agencies priorities in relation to protection, prevention, firefighter, medical responder and police incidents including challenging and tackling anti-social behaviour. The development of the ‘TSSO’ role builds sustainable and strong working relationships with partner agencies. The role integrates within the Police Neighbourhood Team and assists with completing neighbourhood enquiries (101 calls made to police – non emergency). These enquiries afford the TSSO with the opportunity to identify additional areas of concern together with fire safety, safeguarding, anti-social behaviour, protection matters, youth intervention and health difficulties. This provides opportunities for an officer to assist with making agency referrals and arranging multi-agency meetings. The TSSO role has an independent and innovative role profile is aimed at complementing and assisting the existing services and roles within each; one that specifically targets community safety matters and joint agency working. In addition to the extension of the TSSO role at Hayle, an additional two officers have been employed in Bude and Liskeard. TSSOs Adam Chapman (Bude) and Richard Deavall (Liskeard) have been seconded from CFRCS Service and will work in partnership with DCP, SWASFT and Cornwall Council’s ASB Team to develop the role in their respective area. The officers will face varying challenges as these areas differ geographically. In order for the services to adequately understand the outcomes from the pilot, Munro Research and Evaluation have been commissioned in order to carry out an impartial and accurate analysis of the role’s activities, advantages and the challenges that have been encountered. The evaluation will be completed by early summer and will inform future plans. 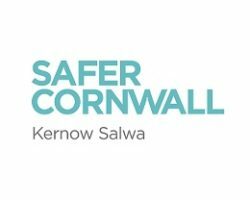 Our multi service aspiration is to expand the locations of this innovative role and provide further protection and prevention to the communities of Cornwall and the South West. 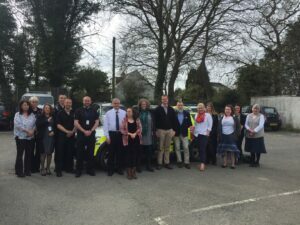 South West Emergency Services Collaboration group, which includes all senior leaders of all emergency services, continue to support and promote this initiative. 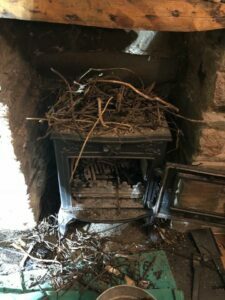 Cornwall Fire, Rescue and Community Safety Service have created a series of fire safety prevention videos, which will be launched through the CFRCSS Facebook page to target the biggest causes of accidental dwelling fires to improve knowledge, awareness and change behaviour promoting fire safety advice in the home during the festive season. A burn injury is for life. The scars are physical as well as psychological, and can present life-long challenges for the individual and their families. What many people don’t know is that children and the elderly are the most vulnerable, and the majority of injuries occur as a result of an accident that could so easily have been prevented. In 2017, 7,502 children were burned or scalded. Hot drinks are the most common cause of scald injury in children – followed by contact with electric cookers, irons and hair straighteners. Good first aid following a burn or scald can make an enormous difference in recovery times and the severity of scarring. “Stop, drop and roll” is used when clothing catches fire. Children can get confused about when to stop, drop and roll. It is important to know when to do this. Children who do not have a good understanding of stop, drop and roll will sometimes do this if they burn a finger or need to get outside if the smoke alarm sounds. Only use stop, drop and roll when clothing catches fire. Cornwall Fire and Rescue Service has operated a fire boat since 1999 when we took delivery of our first boat – Transco Phoenix, a 7.6 metre rigid inflatable boat (RIB) powered by twin 100Hp outboard engines. The Service had identified the need to provide an operational emergency fire response in and around the Falmouth harbour area due to the large and rapidly growing maritime risk. Falmouth was also becoming a popular choice as a venue for hosting large regattas such as the J Class Regatta, The Pendennis Cup, Off Shore Powerboat Racing to name a few, all of which require a large amount of safety/fire cover. Other roles that the fire boat carries out are, to provide personnel and equipment transfer in support of Fire and Rescue Marine Response, Forms part of the King Harry reach response plan, to provide primary fire cover to the 100+ house boats in and around the Falmouth, Penryn and Helford River areas. We can also be called upon by other agencies to be used during high profile events anywhere in Cornwall throughout the summer months. Fast forward 18 years to the start of 2017 and it was clear that Transco Phoenix had served her time and was due for replacement. A tender was put out for Rigid Inflatable Boat (RIB) manufacturers to bid on. After considering certain criteria, Ribcraft who are based in Yeovil, Somerset were awarded the contract. Ribcraft have a long history of building high spec’ customised RIB’s both for the leisure market and, commercial sector. What really stood out with Ribcraft is that the entire boat is built in house at their factory. I was tasked with leading the project at a station/operational level, identifying the needs of the Service and how best these could be fulfilled on the new boat. 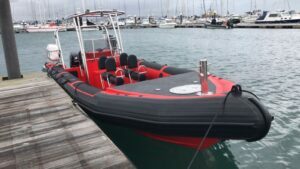 Having had the previous boat to learn from and the luxury of having a RIB built from scratch I was keen to put our own stamp on it and make sure that it would firstly, be fit for purpose, but also easy to use in terms of the firefighting systems. Working with Ribcraft we drew up certain criteria, namely that it would be easily trailable, would have a good working platform, carry a crew of 6 Firefighters and 2 coxswains, carry a light portable pump (LPP) which could be easily got to work and provide a fixed monitor with water. Ribcraft have been an excellent company to work with during the build phase of this project keeping us regularly updated through video calls and myself visiting the factory at key stages of the build to ensure good progress and discuss any issues or improvements that needed to be addressed. Early March, and after some solid and very successful sea trials in Portland Harbour “Skath an Tanlu” (Cornish for “Fire Boat” and chosen by members of the public through public voting) was delivered to the Service. We could not be more pleased with our latest asset and Ribcraft have delivered exactly what was asked of them and their expertise and craftmanship in building RIBs is clearly evident in the new fire boat. Powered by twin Suzuki 140hp engines she has a top speed of 37 knots and a cruising speed of 30 knots, “Skath an Tanlu” is 8.5 metres long with a 3 metre beam (width), providing fire crews with an excellent and safe working platform. She carries a Godiva Powerflow 8/5 Twin LPP providing 800l/min at 5 bar. The boat will be based at Falmouth Community Fire Station and berthed at Falmouth Haven pontoons in Falmouth Harbour during the summer months. It is hoped that “Skath an Tanlu” will be fully operational by July 2018 and it is fair to say that everyone involved is looking forward to getting out and using the RIB for many years to come. Since the stations construction in the early 2000’s there has been a section of land adjacent to the building which was unused and underappreciated. 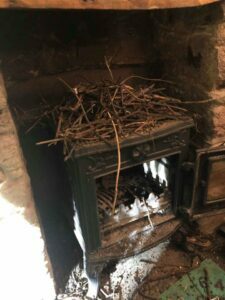 Green watch decided that we must be able to come up with something better for all that would improve things for everyone and make our time at work a better environment that was also healthier and safer for users. We got together as a team and designed a multi-use area that could work on many levels. A self-help project was set up and we looked into the costings, materials and labour required and during the summer of 2017 the watch made a start by hand digging several tonnes of turf and clearing the area ready for the next phase of construction. The foundations were dug, concrete mixed, and walls built by the crew of general builders before we broke out our ‘Chippy’ skills and constructed a timber decking area which also incorporated a nice ‘multi-gym’ arrangement for those who love an outside workout. Approaching completion the green fingered among us became landscape gardeners and when time permitted the finishing touches were applied with the construction of the multi-use timber seating area, wall panelling, chippings and some tubs and planters. The garden was officially opened by Station Manager Dave Pilling in May 2018 during the stations Dementia awareness coffee morning. 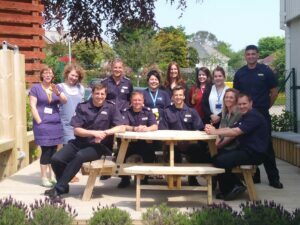 Station personnel and members of our community now use this area to chill out, eat their lunch, briefing, debriefing and lecturing for operational training and now we look forward to Phoenix Services using this area for their Service Delivery. 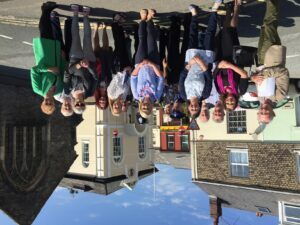 The watch would like to thank ACFO Hewitt for his help and guidance on this project and would like to dedicate their blood, sweat and tears to our Dementia friends around the county with a warm welcome to any local Dementia groups for coffee mornings or get together now the work has come to an end. I’m so pleased to say that already there are regular visits from local dementia groups planned so they can enjoy the fruits of our labours. 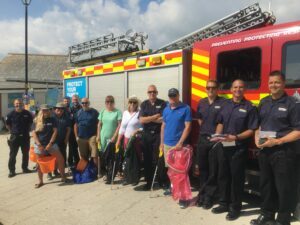 On Wednesday 4 July around 750 adults with a learning disability and/or autism will be meeting the people and machines of the emergency services at Cornwall’s annual Blue Light Day. 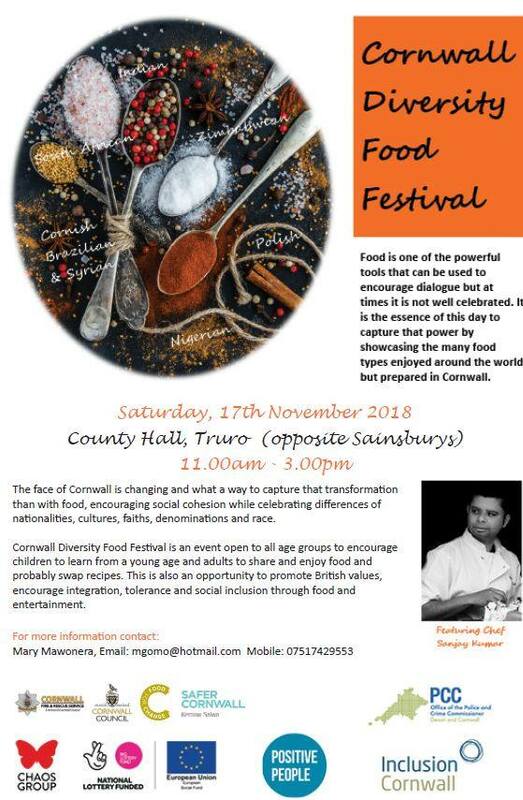 The event, which is being held at the Royal Cornwall Showground, Wadebridge, runs from 10am until 2.30pm and is free to attend. Now in its 11th year, Blue Light Day aims to break down barriers between adults with learning disabilities and/or autism and the emergency services, helping them to be more confident and independent in the community. Highlights of the day will include the attendance of the Cornwall Air Ambulance at midday (subject to operational availability on the day) and demonstrations from the emergency services. 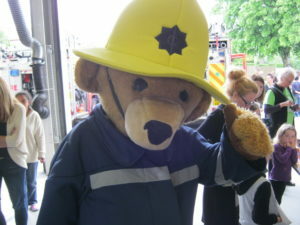 Staff from the police, ambulance, fire, coastguard, mountain rescue and more, together with a selection of their vehicles and equipment, will be there throughout the day as well as fire mascot Blaze Bear and his police counterpart Bravo. 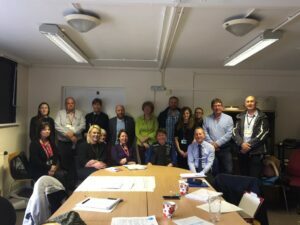 Blue Light Day is organised by Devon and Cornwall Police in partnership with Cornwall People First, a user-led advocacy group for people with a learning disability and /or autism, Cornwall Council and, this year, the Office of the Police and Crime Commissioner. Its success has inspired Blue Light Days in Exeter and Plymouth. Around fifty organisations which provide healthcare and support services for people with a learning disability and/or autism will be on hand to give information and advice. There will also be a range of performances and activities on the indoor stage.